Rasam or chaaru a healthy South Indian dish. It can be consumed with rice or served as an appetizer. The ingredients in it are good for digestion. It's very common dish in every household. The procedure may vary from one to other. Different varieties of rasams are already there in my earlier posts. Some like garlic rasam made with fresh and a special powder. Some we make powders and store them for a long. Some rasam varieties need no powder at all like the one which I am posting now. This recipe I have picked it from my sister-in-law(my husband's brother's wife) Chandra. She learned from her colleague. Really simple and easy dish. Can be made any time. Soak tamarind in water for 5 mins. Chop onion and green chilli..
Mash garlic in mortar and pestle or if you do not have it just crush them with the fingers and drop in the rasam. Take out the juice of tamarind and throughout the squeezed tamarind. Add 2 cups of water. Add chopped onions, green chillies and mashed garlic. Bring it to boil for five minutes. Heat oil in a kadai, add mustard seeds, cumin seeds and red chilli. When they splutter add it to boiling rasam. Switch off the flame and add curry leaves and coriander leaves also. Simple isn't it!! 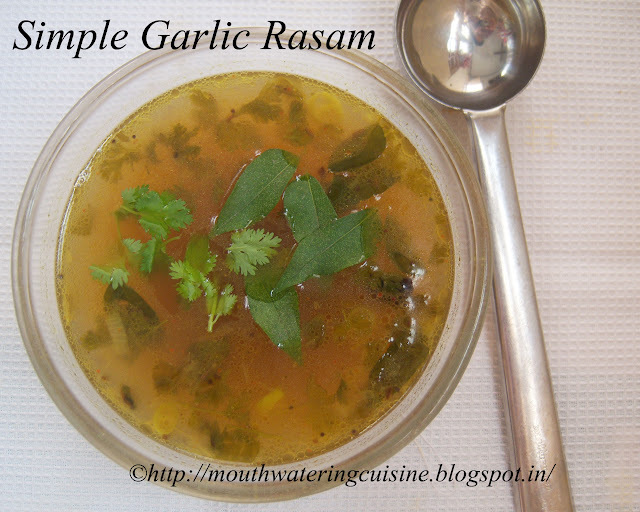 Serve simple garlic rasam with hot piping rice or serve as an appetizer. 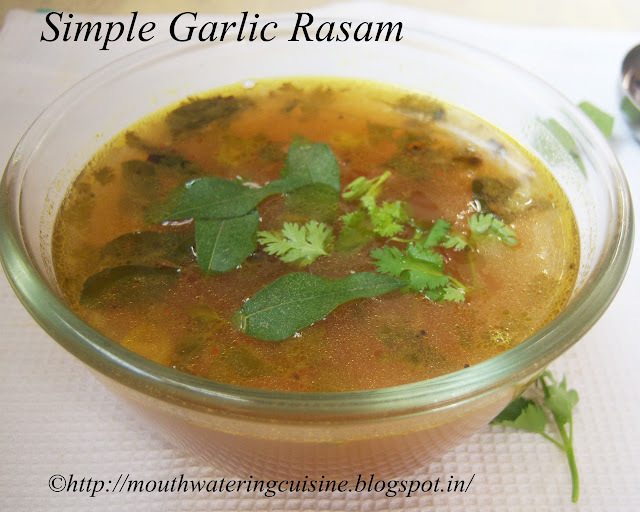 For more rasam varieties click here.